It was a warm spring day in the Northwest Highlands as I met Geoff, Alastair, Mike, Mark, Helen and Brian at Corrie Hallie around Friday lunchtime. Everyone was well set for the trip and we set off bang on time at 12:30. This was to set the tone for the weekend ahead ! It's always a steady pull up Gleann Chaorachain but with the reward of stunning views into An Teallach's Coire Toll an Lochain and ahead to the Fisherfield Munros from the top of the glen. Southerly winds were starting to strengthen as we walked and by the time we'd got to Shenavall Bothy it had clouded over with a weak weather front approaching but the summits remained clear and it was dry. After a brief stop by the bothy, we headed on across the infamous Fisherfield rivers, which proved easy on the day after the prolonged spell of dry weather we've had of late. We continued up into Gleann na Muice, the heart of the Fisherfield wilderness, and set up camp for the weekend. 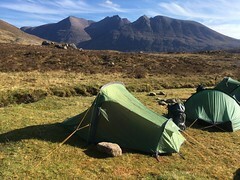 Tents up, gear sorted and dinner eaten, we watched the sunset lighting up the slopes of An Teallach at the bottom of the glen in dramatic fashion and then headed off to bed for an early night before the forecast rain set in. Saturday was forecast to turn into a stunning day after overnight rain had cleared away. We awoke to the sound of a cuckoo calling in the glen (it didn't seem to stop for the remainder of the weekend!) with the hills set against a clear blue sky. We set off at 0900, heading up Gleann na Muice Beag. As we reached the high ground around Lochan Feith Mhic'-illean, the views of the hills were really starting to open up around us. Our route took us high above the remote Fuar Loch Mor, with the northern crags of A'Mhaighdean towering above the dark waters. The path here travels right up the boundary between the Torridonian sandstone of RuadhStacMor and the Lewisian Gneiss of A'Mhaighdean - a geological unconformity where a single step took us across hundreds of millions of years of the Earth's history. From the bealach between the two Munros, it is still a steep pull onto the high plateau of A'Mhaighdean, but on doing so we were well rewarded! The view from this remote peak is often considered to be the finest view from any of the Munros and we saw it at it's absolute best. We took a long time at the summit just letting it all sink in - and taking advantage of the first phone signal we'd had since lunchtime the day before!! Plunging back down to the bealach it was then a steep clamber onto Ruadh Stac Mor. We made very short work of it though and once again could sit high on the remote summit and enjoy views stretching from the Cairngorm Plateau in the east to the Summer Isles in the west and the Outer Hebrides beyond. We heard the cry of a golden eagle somewhere nearby but didn't catch a glimpse. The big birds of prey remained illusive all weekend, not for a want of looking, but we saw plenty of ptarmigan, wheatears and more, with Mike providing us with lots of good ornithological knowledge. Eventually we dragged ourselves away, descending over isolated snow patches on the north side of the hill and made it down to rejoin our uphill route in Gleann na Muice Beag. It was a warm walk back into camp but we kept up a steady pace, reaching camp at 1700, just as we planned it! We could then enjoy a relaxed evening, eating dinner in the sun and watching the later evening light developing on the hills once again. Sunday dawned grey and damp as predicted. There was light rain falling as we prepared for the day and it was a warm, moist walk up Gleann na Muice in the early morning. I was certainly glad we were doing the walk in May as if we had been one month later this would have been optimal midgie conditions! We set off at 0830 to give ourselves the full day to play with and made good progress up this lovely glen. We topped up our water supplies high in the glen, took off some layers and made a warm ascent onto the ridge of Beinn Tarsuinn. En route we caught a good sighting of a small vole that was startled when we appeared over a peat hag and ran around at our feet trying to find its way to it's hole. The ridge itself was brilliant! The weather had dried up by now and a cooling breeze was both refreshing and drying off the rock, allowing for a pleasant scramble to the summit. After a brief pause we headed off around the ridge, following the bypass path under MeallGarbh and steadily working our way up the steep flanks of the Mullach. Low down, these slopes are sandstone and, with Helen training for a summer climbing trip to the Bernese Alps, we took advantage and strung together some nice bits of scrambling up lovely clean rock. This eventually ran out and it was a rough walk to the summit over broken Quartzite. By now the weather had totally cleared and we were once again treated to spectacular views in all directions, from Morven in Caithness to the peaks of Knoydart. Geoff had only 10 Munro Tops left for a complete round to begin the weekend, two of which were down the rugged east ridge of Mullach Coire Mhic Fhearchair, so he left us here to go and 'bag' them while we continued northwards. Steep and loose sums up the descent to the next bealachbut employing due care it went smoothly and we made a nice quick ascent to the moon-like summit of Sgurr Ban. Another snack stop, then we headed down over the rough boulder clad slopes with a few more patches of snow allowing easier passage. We stopped and took a look in the little shelter on the ridge as we passed then headed on towards the last of the Fisherfield Six, Beinn a' Chlaidheimh. 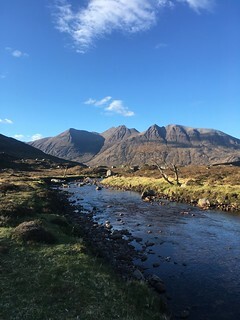 Despite being 'demoted' to Corbett status a few years back, everyone was keen to visit this last peak and complete the classic Fisherfield round. It is a good ascent to this final top but, although the day was now getting quite long, we carried on at a good pace to the narrow summit perch. The views of An Teallach just across the glen were particularly good and there was some dramatic light accompanied by a chilly breeze picking up as a few showers passed to our north and south. We didn't linger too long and headed back down to the bealach with Sgurr Ban where we met Geoff once again, who'd successfully reached his Munro Tops. From here it was time to head back into Gleann na Muice. It had been a busy day on the hills and we'd passed plenty of teams working their way round these remote summits but now we seemed to have the hills to ourselves. Descending past Loch a' Bhrisidh, we replenished our water supplies once more then followed the outflow from the loch downhill. Some evening sunshine gave some very scenic views of the little waterfalls down this stream and beyond to BeinnTarsuinn at the head of the glen. We had little trouble crossing the AbhainnGleannnaMuice and picked up our outward route back to the tents. A steady half an hour took us back to camp and, after an 11-hour day, a well-earned dinner and a dram! We woke early on another glorious morning and packed up to head out. As a group we'd been a well-organised team all weekend but everyone was well on the ball this morning and we were set to go nearly a full hour ahead of schedule! It was a relaxing walk back to Shenavall crossing the rivers with ease once again. The only casualties were Mike's crocs, which were unfortunately lost to the mighty bog that lies between the two rivers! We took a long break at the bothy, then headed up and over to CoireHallie once more. It was warm work but we had some amazing views of the surrounding hills and chat of past and future adventures to keep us going. We even saw a couple of herds of feral goats along the way. It came as a bit of a shock to the system to be back at the road after the weekend's adventure. After a change of clothes and a chat we headed off in various directions after a fantastic trip visiting Fisherfield at it's best! More photos by John King are here on Flickr.